I. Nakata, Generation of Pattern-Matching Algorithms by Extended Regular Expressions. K. Kaneko and M. Takeichi, Derivation of a Knuth-Morris-Pratt Algorithm by Fully Lazy Partial Computation. Y. Tomioka, Computability of Modularization of Constraints. K. Akama, Declarative Semantics of Logic Programs on Parameterized Representation Systems. T. Watanabe, TAMPOPO: An Evolutionary Learning Machine Based on the Principle of Realtime Minimum Skyline Detection. F. Motoyoshi and T. Sato, Implementation of Augmented Logic Language (ALL). H. Sawamura, The Determinancy of a Prolog Predicate Call. K. Kato, A. Ohori, T. Murakami, and T. Masuda, Distributed C Language Based on a Higher-OrderRPC Technique. T. Aratani, N. Kamibayashi, M. Yokoyama, and M. Inagaki, Adding a Multilingual Feature to Smalltalk-80. T. Yasumoto and T. Yuasa, Japanese Character Set Handling in Kyoto Common Lisp. T. Endo, H. Ohki, and K. Takaoka, Drill Text Understanding with Integrated Natural Language and Picture Processing. N. Fujinami and Y. Yokote, Naming of Objects in Large-Scale Distributed Systems. T. Imanaka, N. Fujimoto, K. Uehara, and J. Toyoda, WINCS: A Programming SupportingSystem for Developing Window Control Programs. J. Rekimoto, CSCW Platform System Teidan and Its Concurrency Control Algorithm. This serial is a translation of the original works within the Japan Society of Software Science and Technology. A key source of information for computer scientists in the U.S., the serial explores the major areas of research in software and technology in Japan. 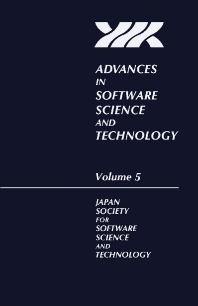 These volumes are intended to promote worldwide exchange of ideas among professionals.This volume includes original research contributions in such areas as Augmented Language Logic (ALL), distributed C language, Smalltalk 80, and TAMPOPO-an evolutionary learning machine based on the principles of Realtime Minimum Skyline Detection. Researchers and students in computer science.